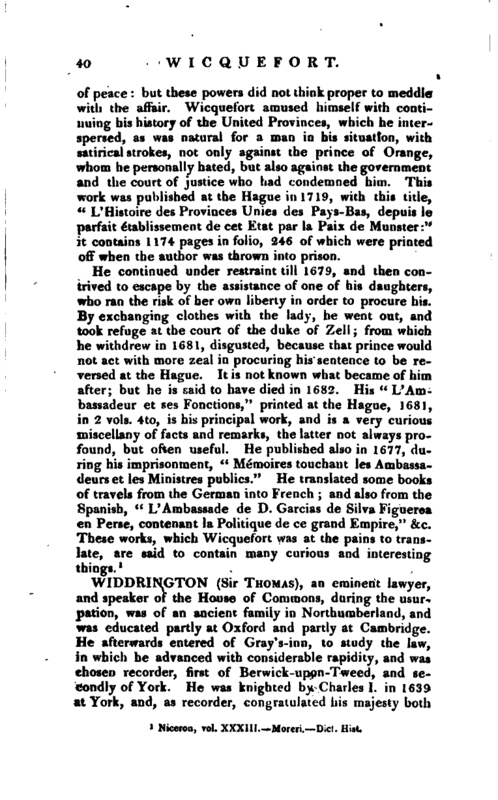 , an eminent lawyer, and speaker of the House of Commons, during the usurpation, was of an ancient family in Northumberland, and was educated partly at Oxford and partly at Cambridge. He afterwards entered pf Qray’s-inn, to study the law, in which he advanced with considerable rapidity, and was chosen recorder, first of Berwick-upon-Tweed, and secondly of York. He was knighted by Charles I. in 1639 at York, and, as recorder, congratulated his majesty both | at York and Berwick, when he was on his way to be crowned king of Scotland. 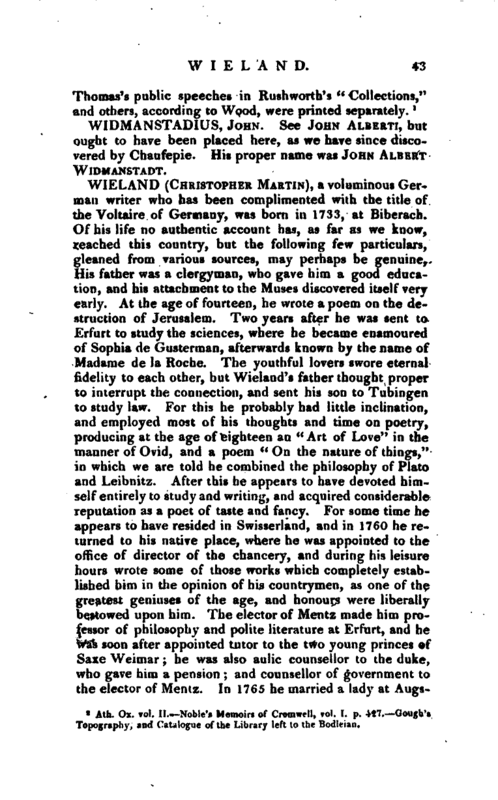 Both his addresses on this occasion are said to have been perfectly courtly and even fulsome, but he was soon to change his style as well as his opinions. Being returned member of parliament for Berwick, he became a warm advocate for the liberty then contested; avowed himself in religion, one of the independent sect, and took the covenant. In June 1647, he was so much a favourite with the parliament that they appointed him one of the commissioners of the great seal, which office he was to retain for one year, but held it till the king’s death. The parliament also named him, in Oct. 1648, one in their call of Serjeants, and soon after declared him king’s s’erjeant. But far as he had gone with the usurping powers, he was by no means pleased with the commonwealth form of government, and immediately after the king’s death, surrendered his office of keeper of the great seal, first upon the plea of bad health, and when that was not allowed, he set up some scruples of conscience. The parliament, however, as he continued to allow their authority, in requital of his former services, ordered that he should practice within the bar, and gave him a quarter’s salary more than was due. His merit also recommended him to Cromwell, who heaped honours and great employments upon him. In April 1654, he was appointed a commissioner of the great seal and a commissioner of the treasury, for which he received a saJary of 100Q/. ; and all his conscientious scruples seemed now at an end. 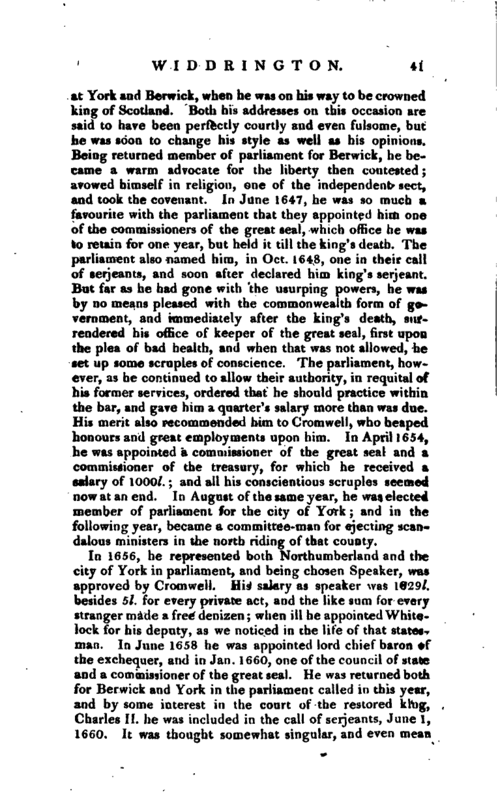 In August of the same year, he was elected member of parliament for the city of York; and in the following year, became a committee-man for ejecting scandalous ministers in the north riding of that county. In 1656, he represented both Northumberland and the city of York in parliament, and being chosen Speaker, was approved by Cromwell. His salary as speaker was 1829l. besides 5l. for every private act, and the like sum for every stranger made a free denizen; when ill he appointed Whitelock for his deputy, as we noticed in the life of that statesman. In June 1658 he was appointed lord chief baron of the exchequer, and in Jan. 1660, one of the council of state and a commissioner of the great seal. He was returned both for Berwick and York in the parliament called in this year, and by some interest in the court of the restored king, Charles II. he was included in the call of serjeants, June 1, 1660. It was thought somewhat singular, and even mean | that be should have submitted to this, as he had so long borne that title, had filled high offices in the state, was by no means a young man, and was possessed of a considerable fortune. With regard to his fortune, however, he had suffered some loss. He and Thomas Coghill, esq. had purchased the manor of Crayke, belonging to Durham cathedral, which was now ordered to revert to the church again. On the other hand, as some compensation, he was appointed temporal chancellor for life of thai bishopric. He died May 13, 1664, and was buried in the chancel of St. Giles’s in the Fields, where a handsome monument against the north wall was placed by his four surviving daughters, ten years after, but it does not now exist Although sir Thomas had drank deep in the spirit of the times, we are told that his great abilities were only equalled by his integrity, and it was probably the latter which procured him favour after the restoration. He married Frances, daughter of lord Fairfax, of Cameron, and sister of lord Fairfax, the parliamentary general; she died in 1649, and likewise lies buried in St. Giles’s. Ath. Ox. vol. II. 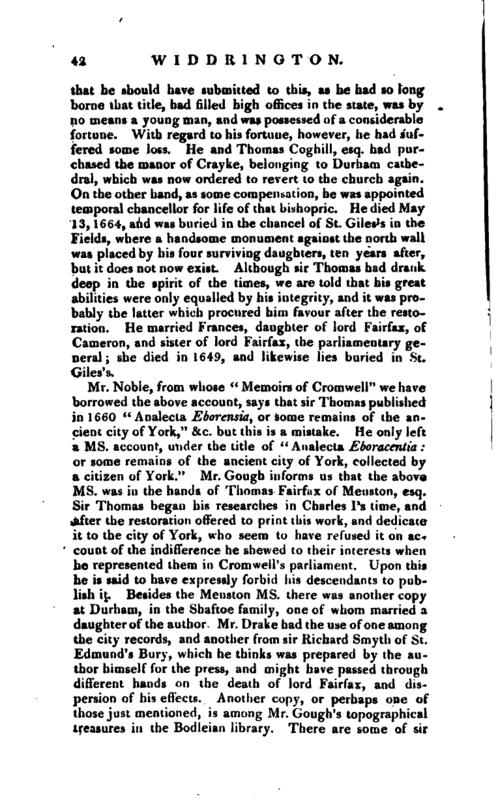 Noble’s Memoirs of Cromwell, vol. I. p. 427. Cough’s Topography, and Catalogue of the Library left to the Bodleian.